If you are a big fan of waterfalls, then you are in for a real treat if you ever visit the Portland, Oregon area. There are some incredibly beautiful falls in North America, with Niagara Falls in New York State probably the most famous of those. Though Multnomah Falls in Oregon doesn’t get the notoriety that Niagara Falls gets, it is a beautiful waterfall in its own right. Situated in the Columbia River Gorge just outside of the city of Portland, the backdrop for the waterfall could not be more beautiful. This large, cascading waterfall seems to come out of nowhere as it cascades over the ridge and into the river gorge. With an observation bridge at the halfway point of the cascade, the views you can get of the waterfall are breathtaking. In this guide, I am going to give you all of the information you need to visit the Multnomah Falls. 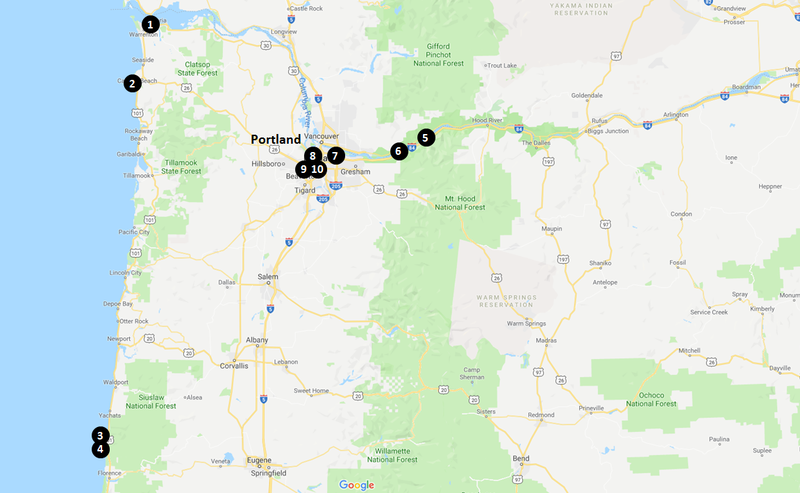 I am going to outline how to get to the Multnomah Falls, when the best times are to make your visit, where to stay while you are in the Portland area, and what else you can see while you are on your trip. As I mentioned before, the Multnomah Falls are located in the Columbia River Gorge, which sits just outside of Portland in the state of Oregon. 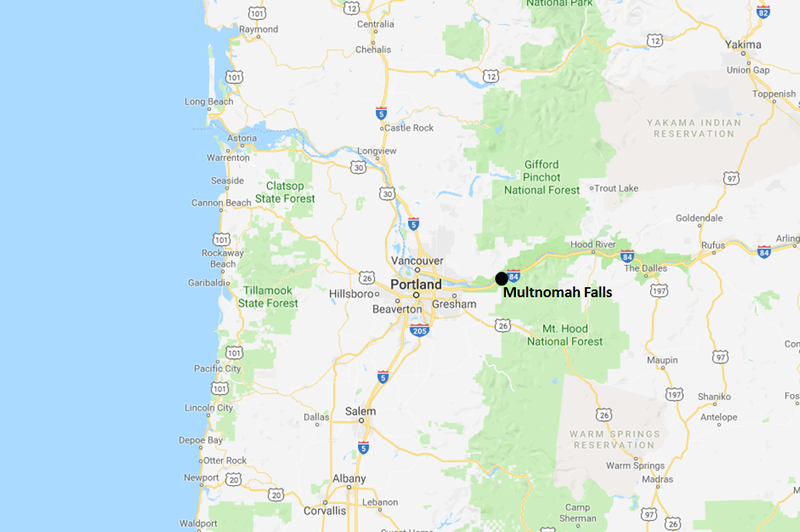 If you are staying in Portland, the falls are only about 30 miles East of the city, which is a quick 40-45 minute drive. They are also in relatively close proximity to a number of other great attractions in the area that I listed in the table below and will highlight in this guide. The Multnomah Falls are located right off of highway 84 and there is a designated parking area where you can park while you visit the falls. There is no cost to visit the falls, but if you would like stop at the visitor center for information it is only open from 9am to 5pm daily. The visitor center is located on the ground floor of the Multnomah Falls Lodge and includes an information desk, a gift shop, a snack bar, a restaurant, and restrooms. As you can see in the site map below, there are plenty of hiking trails that you can explore within the site. The most popular hike is up to the top of the 542-foot tall cascading waterfall. 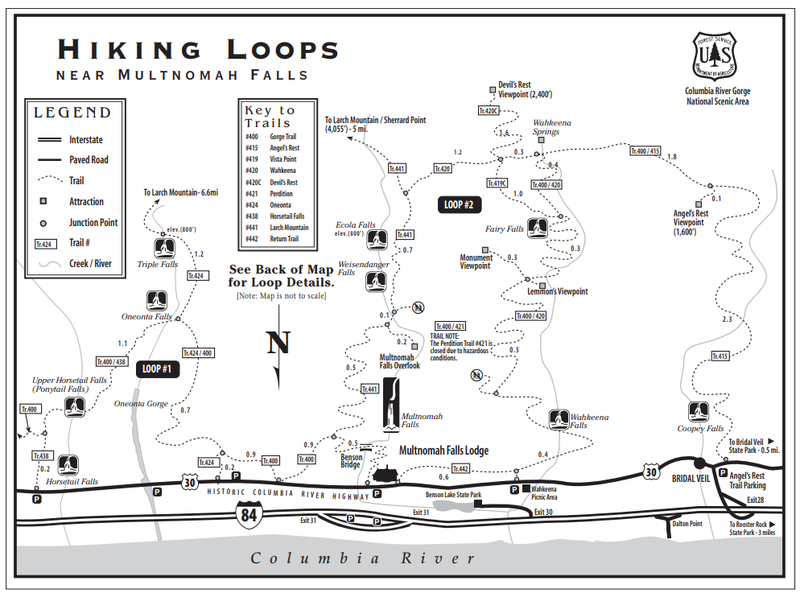 The 2.2 mile hike to the Multnomah Falls viewpoint has an elevation climb of roughly 700 feet and is considered a moderately difficult hike. To assist you in determining the best time for you to plan your trip, I have included some information on average temperature, average precipitation levels, and the average number of visitors for you to review below. During the winter months of December thru February, it does get cold in the Portland area, but you typically don’t see the brutally cold temperatures where it falls well below zero degrees Fahrenheit that often. With average highs in the low-to-mid 40’s, the winters are rather mild. Likewise, during the summer months the high temperatures typically don’t get unbearably hot. With the average highs in the upper 70’s and low 80’s during the summer months of June thru August, the summers are rather mild as well. Because Portland is located near the Pacific coast, the amount of rainfall the area sees is typically higher than you would see in the American Midwest or Southwest. The rainiest months of the year are the late fall and winter months of November thru January. If you visit during this time, be prepared to see a fair amount of rain or snow. During the summer months of July and August the precipitation levels are the lowest, so you have the best chance of seeing good weather. It should come as no surprise, but the majority of tourism interest in the Multnomah Falls. This is when the temperatures are the warmest and the weather is the driest. If you are visiting during the months of June thru August, you should be prepared to deal with more crowds then you would see during other times of the year. NOTE: The chart below is from Google Trends and shows the relative amount of Google searches for the Multnomah Falls by tourists throughout the year. The numbers are calculated relative to the peak month, which is early July. For instance, August 8th saw roughly 82% of the searches for “Multnomah Falls” as the day of July 1st, which was the peak day. If you are going to visit the Portland area to see the Multnomah Falls, I would suggest that you look at lodging in the Portland area. To assist you in finding a good hostel or hotel, I have included a list and a map with some recommendations at different price-points for you to consider. If you are looking to camp out in the area, I have also listed a number of popular campgrounds below for you to review. Below is a list of some of the more popular campgrounds in the Columbia River Gorge area. If you are looking to book a camp site during the summer months, I would suggest you make your reservation well in advance. While you can get some great views of the falls at the bottom, there are a number of great hiking trails in the Multnomah Falls area that will allow you to get some much closer views of this beautiful waterfall. I have included a map from the US Forest Service that outlines all of the hiking trails in the area below for you to review. In addition to the Multnomah Falls, the Portland area has a number of other amazing things for you to see and do. In order to assist you in planning your trip, I have included a list of some of the other great things to see and do in the area below for you to review. The Multnomah Falls are stunningly beautiful. It’s one of those places where you don’t really have to try to get amazing pictures, they sort of just take themselves. Below is a gallery of just some of the pictures I was able to get during my visit. Love all the info you provided. I’ll add it to my list of things to do next time in I’m Portland! Great post. I’d never heard of these falls. I envision a petsit 😉 in Portland in my future, so I will keep this in mind. Thank you! Awesome post. Multnomah Falls is one of my favorite waterfalls in Oregon! Thank you so much for the kind words. It’s my favorite too!